The United States Congress designated the Kuiu Wilderness (map) in 1990 and it now has a total of 60,183 acres. All of this wilderness is located in Alaska and is managed by the Forest Service. 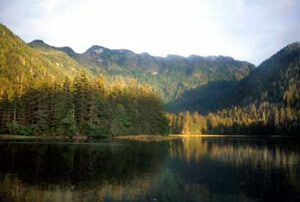 The Kuiu Wilderness is bordered by the Tebenkof Bay Wilderness to the north. Kuiu Wilderness is bordered on the east by Sumner Strait and on the west by Chatham Strait and near the southern end of Kuiu Island. The northern boundary is shared with Tebenkof Bay Wilderness. Three major bays (Port Malmesbury, Port Beauclerc and Affleck Canal) indent a coastline of smaller bays, coves and canals and offer some safe anchorages. Several small offshore islands are included in this Wilderness of forest and muskeg. Several peaks rise to over 2,000 feet. Planning to Visit the Kuiu Wilderness? How to follow the seven standard Leave No Trace principles differs in different parts of the country (desert vs. Rocky Mountains). Click on any of the principles listed below to learn more about how they apply in the Kuiu Wilderness.